Thank you for completing my poll. 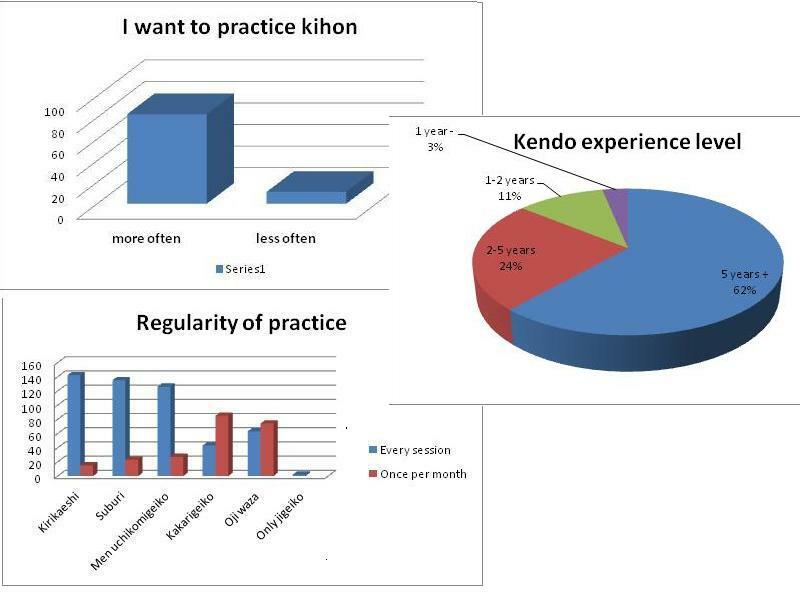 As the graphs show, we are quite a conscientous bunch,most of us practising suburi and kirikaeshi at every session. We are less enthusiastic about kakarigeiko and oji waza drills, but overall we like kihon-geiko and want to do more. My supposition that there were lots of fat cats out there who only turned up in time for jigeiko was entirely wrong. What made the results even more interesting is that the bulk of my respondents have at least 5 years experience. As always, you made some interesting and valid comments. I was particularly interested in Dillon’s thoughts from a “training in Japan perspective”. From my own experience of living and training in Japan, and of still visiting quite frequently, I agree that the onus for adult kendoka is on organising your own kihongeiko if you feel you need it. In the majority of town or city machi dojo that is the case and often the only way to get basic training is by joining the kid’s class. 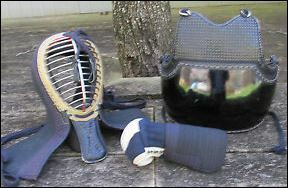 In university clubs and in police kendo academies such as Tokyo kesicho or Osaka fukei, training consists predominantly of kihon drills, but in many dojo where there kihon training is less formalised, adults still do it either with motodachi, or in the case of some senior kendoka with each other on a “one-on-one” basis”. I have quite frequently been to open keiko sessions and had 15 or 20 minutes of kihon with a friend before joining the jigeiko. The other option is to seek out sessions taught by sensei who are known to teach basics. Uegaki sensei in Yoshino, although in his mid 60s, survives on a regime of kirikaeshi, kakarigeiko and semegeiko, as of course do his students. 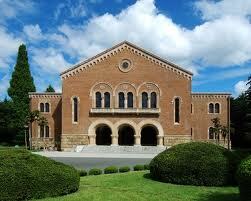 I went with him to an asageiko session in Sakai where his teacher, the late Furuya sensei was in charge. The average age of kendoka there must have been over 60 and the average grade 7th dan, with several 8th dans taking turns as kakarite. We did kakarigeiko for an hour! In Japan, you have access to the best kendo in the World, but that does not mean that everyone there trains to the highest level. There are many dojo where you can turn up once a week and enjoy your jigeiko, relying on the basics you developed in junior high school. There is clearly nothing wrong with this. Kendoka who make an appearance as and when they can, and enjoy their training, are the backbone of Japanese kendo. Those that make it to the kodansha ranks however, particularly those who reach 8th dan, seldom do so without repeatedly reviewing and polishing their basic technique. And the only way to do this is through repeated kihon practice. Last week when I was in Tokyo, I was lucky enough to be invited to practice with the kendo club of Hitotsubashi University. Whilst I have practiced at a number of Japanese university clubs over the years, I tend to forget just how hard kendoka work at this stage of their careers to ensure that the fundamentals are in place to develop shiai and jigeiko skills. Two thirds of the allotted keiko time was devoted to kirikaeshi, uchikomi geiko and yakusoku geiko. I was impressed by the fact that everyone from first year students on up knew all the drills and their sequence inside out. Of course the club captain provided the appropriate words of command, but everyone went through the whole session on autopilot, concentrating only on doing each technique faster and better. Chiba sensei who is Hitotsubashi Dai’s Shihan, was able to stay aloof from the process of running the session and only intervened to make corrections or suggestions to individual members. Only after this kihon was completed were visitors brought into the final thirty minute jigeiko session. With twelve or so of these young kendo machines lined up for keiko with me, half an hour of flat-out practice was all I needed. However after I left for a beer with Chiba sensei, the students continued their practice to concentrate on preparation for that weekend’s shiai with universities from Osaka and Kobe. What I find particularly interesting is that Hitotsubashi University does not have a particular kendo or physical education focus. Its reputation in Japan is primarily that of an elite academic institution, so of course the students all have to spend a great deal of time focussing on their studies. Nevertheless it was obvious that kendo plays a major part of their lives, both in and out of the dojo. It was also clear from Chiba sensei’s opening and closing remarks that the objective of the university kendo club was not just to develop effective tactical kendo but to promote the holistic values of kendo and its impact on everyday life. Certainly, judging by the way visitors are treated by these students, sensei has done a great job in reinforcing the true spirit of reigi. I understand that next year the Kendo Club of Hitotsubashi Daigaku is going to make a visit to Imperial College in London with the aim of establishing an official twinning relationship. Imperial also has the reputation for attracting some very bright students, so next year should see a meeting of minds as well as kendo spirit.